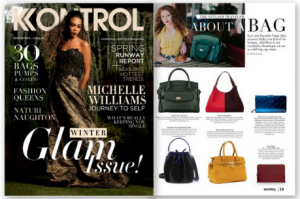 Congratulations to our Client Robert Matthew for their feature in Kontrol Magazine! A must have accessory for this season, the Hailey Tote from Robert Matthew is your perfect go-to classic mid-size tote. Handcrafted with textured animal friendly faux-leather, light gold hardware accents and lock adornment. Outwardly a classic geometric tote, but peek inside to find beautifully designed paisley interior fabric lining with many zipper pockets to keep your things nice and tidy! Carry this bag as a tote with the dual top handles or utilize the shoulder adjustable and removable shoulder strap for added convenience and comfort! Robert Matthew is dedicated to creating the hottest fashionable, yet functional, handbags and accessories that women around the world are proud to flaunt. Check them out at robertmatthew.com!